Arizona Rejects Birthright Citizen Bills; Utah Pushes Immigration Reform : It's All Politics Weary of the negative attention they received last year for their controversial law getting tough on illegal immigrants, Arizona lawmakers rejected birthright citizenship bills as a distraction from state budget woes and other problems. Meanwhile, conservative Utah is leading on immigration reform. 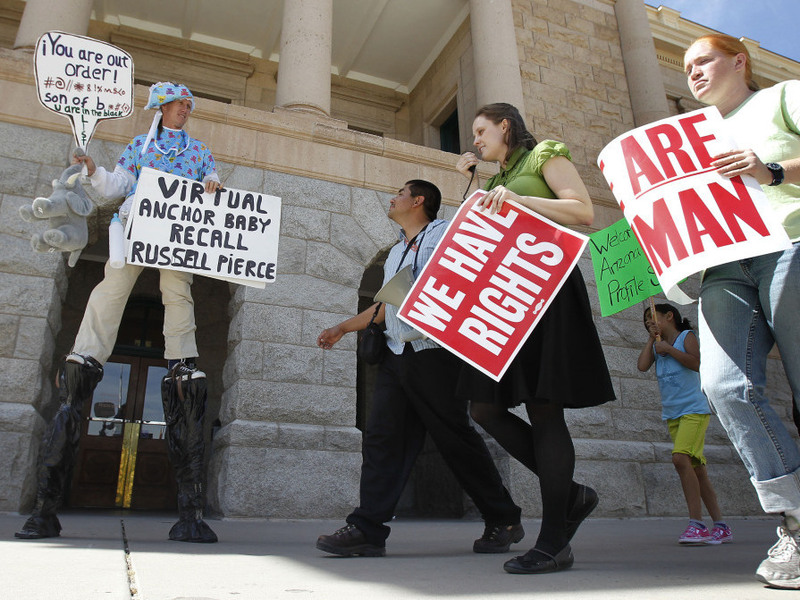 Protesters against the latest immigration bills in Arizona, March 17, 2011. Immigration as an issue has been on the sidelines as of late, with attention focused on international crises, federal fiscal issues and state governments fighting with labor unions. But there are a couple of immigration stories to take note of this Friday. First, Arizona's may have gotten a lot of attention last year for its controversial anti-illegal immigration legislation requiring tougher enforcement. On Thursday, however, Arizona lawmakers, including Republicans, beat back efforts to pass birthright citizenship legislation and other bills targeting illegal immigration. While some of the arguments against the legislation had to do with notions of fundamental fairness as well as adhering to the U.S. Constitution's long-standing requirements for citizenship, resistance to the bill also came from lawmakers clearly weary of all the bad press the state had received. Sen. Steve Yarbrough, R-Chandler, said the state should be focused on its budget and not on a divisive issue that puts Arizona in a bad light. He said he didn't believe the bills would accomplish their larger goal. Sen. Steve Gallardo, D-Phoenix, said the bills would be bad for business. "As we continue to try and improve Arizona's economy, to try and bring in new businesses to the state of Arizona, these types of legislation are not helping us move the economy forward," Gallardo said. Sen. Paula Aboud, D-Tucson, called the measures "morally reprehensible." Meanwhile, NPR's Mara Liasson reports on what to many will seem like a paradox, that a very conservative state like Utah should be on the vanguard of immigration reform. As Mara reports, Utah is attempting to come to terms with the presence of illegal immigrants in the state through legislation to give them legal status in the state so long as they meet certain requirements. Last Wednesday, Utah's Gov. Gary R. Herbert signed a package of immigration bills. One is an enforcement law, milder than Arizona's, but still opposed by liberal immigration advocates. Another is a guest-worker bill, which is opposed by some conservatives as amnesty. State Rep. Bill Wright, who wrote part of the law, says he was just trying to deal with the reality that there are 11 million illegal immigrants in America, and they are never going to be deported. "I'm of the opinion that we really don't have the ability as a society to remove that large a portion of a segment from our society — either the cost, or just the damage it would do," Wright says. "A lot of these people are intertwined in our society. They have financial obligations: they have bank notes; they've bought houses; they contribute; they have jobs," he says. Operating from that premise, Wright's guest worker permit law says that if you pay a fine, have no criminal record and are working, you can stay in Utah. Utah's new law has thrilled immigration reform advocates like Frank Sharry, founder of America's Voice. "The Utah legislation is a very rough draft of what we call comprehensive immigration reform at the national level," Sharry says. "It combines enforcement and a program to make those here legal," he says. As Mara notes, Utah would prefer the federal government take the lead since the nation's illegal immigration problem can't effectively be solved on a state by state basis. But with immigration reform not presently on Congress' agenda, lawmakers in Utah and elsewhere are being forced to act to deal with an issue they can't ignore as easily as federal policymakers seem able to.